If you go down to the woods today, ( as long as it also has dollops of water! ), you may hear a sound rather like somebody sanding stonework. Well not quite yet but maybe soon. However in the grounds of Escot Estate, Devon, you can hear such sounds of an evening should you venture near the stock ponds alongside the Capability Brown designed lake. For within these ponds lives a pair of Rodents once hunted to extinction in the UK. Now reintroduced to Scotland on a trial basis, a feat we hope to see expanded to the UK as a whole. 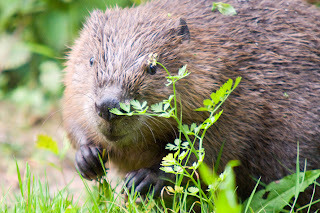 what can they be I hear you ask, well even if you didn't, I'll tell you - Beavers! The sound - their gnawing at fresh tree stock for food or lodge building. 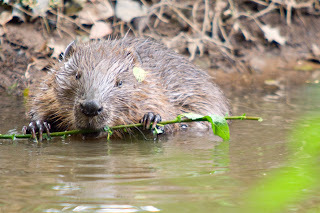 Beavers are entirely herbivorous and unlike tales to be heard do not eat fish. 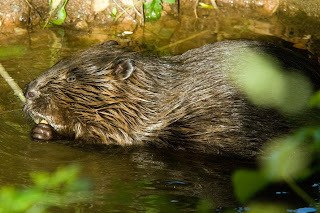 They were hunted for their fur, meat and due to their diet which consisted of a heavy dose of Willow their scent glands could be used as a form of aspirin. 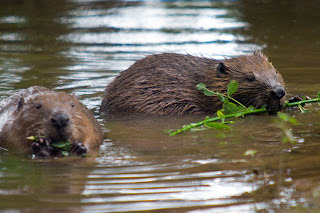 The pair at Escot have not only built one dam but two, the second with a lodge complex built in and yes the reason for this has recently proved to be for the purposes of a family life, earlier this year they gave rise to a pair of Kits. This is the first case of Kits being raised in natural environment in the uk for nearly 800 years, quite a feat and coup for the estate. Fabulous photographer, along with very interesting facts! Great Blogspot, will recommend all to visit! Looking forward to future updates!! Any images of adders in Devon?